You Are Sure to Agree: Life lacks something when you cannot get a Good Night’s Sleep! A lumpy or thin mattress does not allow you to sleep as you should! So how do you find the best mattress? Your mattress is the most important part of your bed! That’s what you lie on. Memory foam conforms to your body shape and gives proper support to your hips and shoulders. But which memory foam mattress is best? It isn’t easy to find the best memory foam mattress – but I can show you how. I have tested all kinds of mattresses and checked mattress reviews worldwide to come up with best memory foam mattresses. Memory Foam Topper Pads – Good or Bad? Here is my opinion on how you can sleep well in comfort, backed by personal experience and worldwide reviews. I have reviewed mattresses of the same thickness – the 12” Queen size variety where available in the range. *** Available in 10-inch thick only. I have read a large number of memory foam mattress reviews, and also surveyed those using them. I have compiled this list of the best memory foam mattresses I could find to help you choose the brand that seems best for your personal needs. Thickness of mattress – I am comparing 12-inch thick Queen-size mattresses. Some brands offer lower and greater thicknesses, although 12-inch is taken as a standard for comparison purposes. Thickness of memory foam layer. Density of mattress in pounds per cubic foot – or Low, Medium, High. Not all manufacturers provide an actual figure. Positive vs. negative consumer reviews. Mattress size: The size required can be stated at checkout. I have indicated the more popular sizes available, Twin, Full, Queen, King, California King. Some are also available in other sizes. What we have not considered is country of origin. Not all mattresses are made in the USA – many of our best buys have been manufactured out of the USA, or put together in the USA using foreign materials. 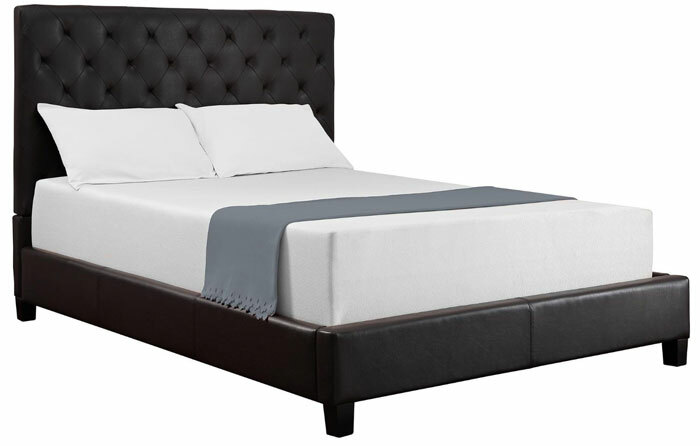 This mattress from the highly-rated Signature is made using CertiPUR-US certified foam. This certification indicates that the foam has been manufactured without ozone-depleting chlorinated flame retardants. They are environmentally-friendly flame retardant foams. They contain no heavy metals such as lead, cadmium and mercury, and are formaldehyde and phthalate free. They also conform to low VOC emission standards for indoor air quality – lower than 0.5 parts per million (ppm). The mattress itself consists of a 4 inch memory foam layer over 8 inches of high density polyurethane foam. This is a sufficiently thick layer of memory foam to offer good support AND molding to your body’s shape for maximum comfort. The high density foam beneath it provides extra comfort from what is a wonderfully thick mattress suitable for all bed bases. Refer to the memory foam buyer’s guide below. The Signature Sleep Memoir Foam mattress is available in a number of popular and regular sizes. You can choose your size at checkout. The Signature Sleep Memoir Foam mattress is available in Twin, Full, Queen and King sizes, and in thicknesses for each of 6, 8, 10 and 12 inches. You can choose your dimensions at checkout. One 4″ layer of Memory Foam on top (ILD 9.0 – see Buyer’s Guide below and check the PU Foam Website) followed by a 8″ layer of high density foam, the Memory Foam molds to the body’s natural shape. Foam is low in VOC emissions for indoor air quality (less than 0.5 PPM). Made without phthalates regulated by the Consumer Safety Product Commission. The Signature Sleep Memoir 12 mattress is made with CertiPUR-US certified foam. This mattress has a soft, knit fabric cover. Most people found it comfortable and amazing for the price. According to reviews, the mattress tends to improve with time, which is what memory foam is all about. Editor’s Note: Such comments, positive and negative, are to be expected of any mattress. Some people may be too light or too heavy in weight for the mattress they purchase. They may also not have given the mattress sufficient time to conform to their weight and pressure points. This mattress is generally excellent, and gives an ILD figure. See the Buyer’s Guide below for information on Indentation Load Deflection. Others may love the experience of a mattress that conforms to the shape of their body, while some may not. Some people simply prefer a traditional spring mattress. This is our best rated memory foam mattress because it meets all the requirements of hardness and compressibility needed for a good mattress. It is also environmentally friendly, an important factor in the choice of many people. 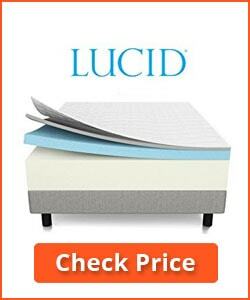 The Lucid 12-inch Plush Memory Foam Mattress provides two memory foam layers over a standard foam base to offer a luxurious feel to the mattress. 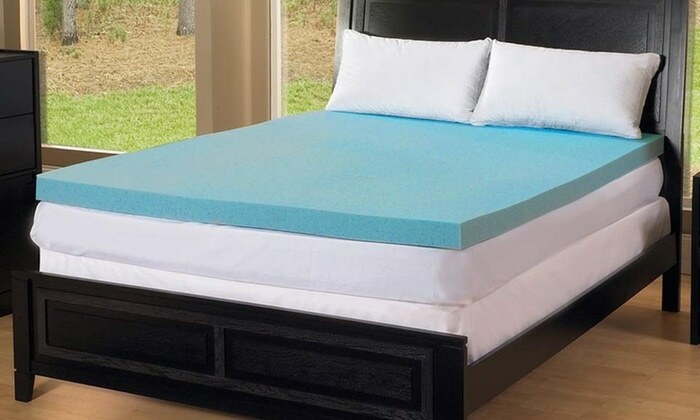 The main memory foam layer this consists of a 3” layer of gel infused memory foam that not only hugs to your figure to relieve pressure on your hips and shoulders, but also permits a good flow of air for temperature control. The foam is CertiPUR-US certified, so conforms to the US safety requirements for such mattresses. Immediately below this is a 1-inch bamboo charcoal memory foam layer that absorbs odors and keeps your mattress smelling fresh. This layer is contained within a soft moisture-wicking Tencel blend cover, regenerated from wood cellulose. NOTE: The 14-inch version of this mattress consists of 3” of regular memory foam, then a 1-inch layer of bamboo foam. The other 8” is ordinary high-density support polyurethane foam. The extra 2 inches is therefore ordinary foam. Gets 81% 4—5 star reviews against 13% 1-2 stars. Most are happy with the degree of hardness, and also with its performance as a memory foam mattress. Many complain about the lack of consistency of the memory properties over time, and also in hardness and support between different purchases of the same mattress. Editor’s Note: The comments regarding inconsistency between different purchases of the same mattress are concerning. However, overall, the ratings are good for this memory gel foam mattress. It conforms to all the regulations and is one of the better gel-infused memory foam mattresses on the market. 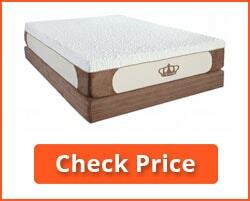 Like all such mattresses, it does not meet all tastes or expectations, hence the 4.5 rating. The Zinus 12” memory foam mattress is infused with green tea. This absorbs odors and keeps the mattress fresh. Whether this continues once the initial VOC vapors have been released and dissipated is debatable, but that is what is claimed. This mattress comprises 3” memory foam on top, followed by 2” comfort foam, 3.5” Airflow HD foam and 3.55” Airflow HD base support foam. 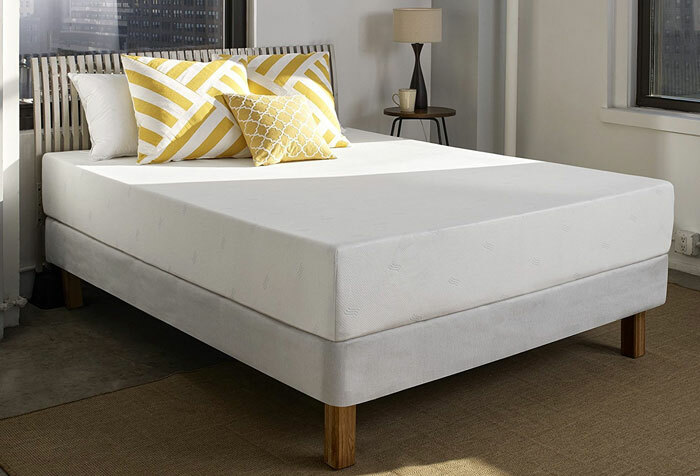 The comfort foam helps the memory foam conform the mattress to your body shape, while the Airflow High-Density layers help with cooling and overall support. Green tea helps to reduce the odor that comes from all new memory foam mattresses. The foam is CertiPUR – US Certified for durability, performance, and content. The 3” layer of memory foam is just enough, particularly in view of the quality of the layers below. 87% of reviews give 4-5 stars with just 8% 1-2 stars. There appears to be consistency issue: you either get a great mattress or a poor one. There are more ‘great’ than ‘poor’ but this is still a negative that the company should address. Most issues are with softness and sagging in the middle. However, 87% liked it. Editor’s Note: This mattress seems just on the soft side of medium. However, most people appear to like this and find the memory foam function acceptable. One issue we are finding is that few mattress companies provide an ILD rating. This is one of those that do not. Consistency drops its rating here. The Zinus Sleep Master Ultima Comfort memory foam mattress comprises 3” of memory foam over 3” of pressure-relieving comfort foam. These layers rest on a 6” layer of high-density support foam. The result is good firm mattress that protects your hips, shoulders and other pressure points. 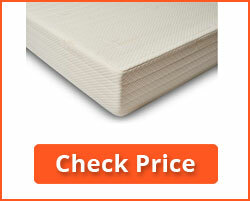 As with the others, this mattress uses CertiPUR – US Certified foam for durability, performance, and content. Natural plant oil is used in the memory foam to absorb odor and keep the mattress smelling fresh. Gets 89% 4 and 5 star reviews, and just 7% 1 and 2 stars. Most people find it very comfortable and would purchase again. The 3” of memory foam is OK, while being on the side of good, but seems to satisfy most people. Some issues with life – the mattress tends to sag with age, and the memory aspect has received criticism. It is claimed to be a 3lb density mattress which is a bit on the low side. Editor’s Note: Many comment on the lack of life of the thinner 8” and 10” versions, so the 12” seems the one to choose. Although the Zinus Sleepmaster Ultima has received some criticism, the vast majority have no issue with the 12” Queen version reviewed. Again, 3” is at the low side of acceptability for a memory foam layer. DynastyMattress offers a gel memory foam solution to comfortable sleeping in its Cool Breeze model. It provides a 3” gel memory foam top, a second 4” layer of Cool Airflow Foam that cools the memory foam where it is most compressed, and a 5” base of high density base as a support layer. The memory foam is infused with green tea extract to promote freshness. The 3” gel infused memory foam layer provides full contact with your body, and hence greater comfort for your shoulders, hips and elbows. Gel foam also permits a good flow of air through the mattress, stopping it from overheating. The CertiPUR-US certified foam conforms to the US mattress safety requirements, and the 4” layer of Cool Airflow foam reduces the temperature of the memory foam even further. Overeating has been one issue with regular memory foam in the past. The 3” layer of gel memory foam is just sufficient to offer effective support for your pressure points. The other two layers contribute to cooling and support. This mattress gets 84% of reviewers providing 4-5 stars and just 11% 1-2 stars. The 3” memory foam is on the border between sufficient and not. However, the other layers tend to make up for this by offering additional cooling and support. Some comment on the off-gassing of solvent vapor, although this dissipates with time and is not harmful. Editor’s Note: This mattress starts out very firm, but softens fairly quickly to become a good medium hard memory foam mattress. Although the memory layer is just on the acceptable limit of 3”, the fact that it is gel foam, and the 4” cool airflow foam layer, make up for that. The Brentwood Home Bamboo gel memory Foam mattress is available only in 11” and 13” thicknesses, so we are reviewing both here. The 11” mattress gives you just 2.5” of gel memory foam while the 13” version gives 3.5”. The extra inch is therefore memory foam and well worth paying the extra $74 for. The rest comprises a 2” thick Ventlux ventilated area to allow good air flow, while the other 6.5”/8.5”is a high density foam support base. According to the company, the overall density is 4 lb for the 11” and 5 lb for the 13” version. The mattress cover is made using bamboo fiber and wool designed to wick away moisture and keep you cool in summer and warm in winter. The cover can stretch in every direction, so there is no resistance as you move around the memory layer. 85% of people give it 4-5 star rating while 10% give it a 1-2 star rating. No 12” version, though that is not a serious omission. Most complaints relate to the mattress being too hard and others to it becoming too soft over time. Some comment on the memory foam being too thin, and for the 11” mattress 2.5” does seem rather thin. Editor’s Note: Again, here we have a memory foam layer of 2.5” in the 11” mattress being criticized by many for it becoming too soft over time. It seems that the thinner layers appear to degrade with use and lose their hardness. The 13” mattress is fine which is why we have placed this at position 6. The Sleep Innovations Shiloh 12” Memory Foam Mattress is available with a quilted and smooth cover. We are reviewing the 80 lb weight quilted version – the smooth version weighs 93.9 lb. The foam consists of a 2.5” layer of air-channel foam immediately below the 2.5” memory foam layer. This layer draws in cool air from the sides of the mattress to reduce the heat generated by the memory foam, particularly immediately under your body. There is then a 7” layer of support foam, providing a mattress of medium density. The air channel may help to reduce heat generated in the memory foam by the body. The mattress is available in a quilted cover or smooth cover version. The smooth cover version weighs 93.9 lb against the 80 lb of the quilted version. Gets 85% 4-5 star reviews and just 11% 1-2 stars. Many who purchase it believe this to be a good, comfortable mattress. Nevertheless, the thin memory layer counts against it. Editor’s Note: The 2.5” memory foam layer is low, and at least an extra 0.5” would have helped the ‘memory function.’ The weight of the smooth cover mattress is high at almost 94 pounds. This model is apparently available only in 10-inches thickness, so we are reviewing that. The Sleep Innovations Shea mattress consists of a 3” layer of SureTemp Memory Foam over 7” of support foam. It is suitable for small to larger people, particularly for side and back sleepers where the memory foam layer supports pressure points. As with all the others, the foam layers are CertiPUR – US Certified foam. The memory foam layer is 3-inches, just on the limit for a longer-lasting effective memory foam action. 83% of people gave it a 4-5 star rating, while 12 gave it just 1-2 stars. Many of the complaints related to a lack of comfort, and the density breaking down over time. Others found the mattress improved over 2-3 months although some found it degraded. Much of this may have been due to the size and weight of the people using it. Editor’s Note: There were references in the external reviews to a 12-inch version, but it was not available on the Sleep Innovations website which listed only the 10-inch version. We have struck to that for the review. This may be a good mattress for smaller, lighter people, but there seems to be some issues with life and how long it takes to work correctly. This mattress comes with very little information on hardness or ILD. However, it gets good reviews. It is available only in 10” thickness and consists of a 2” top layer of cooling CertiPUR-US Certified Avena® foam. This top layer provides comfort and cooling. The second layer is 2” memory foam, and there is a bottom layer of 6” high density support foam. As a memory foam mattress it may not be ideal, the memory layer being only 2” and hidden beneath 2” of ‘latex-like’ Avena foam. It does get good reviews as a mattress, but as a ‘memory foam mattress?? There is not a lot of information about the Leesa mattress on its website, so it’s very much a case of try it and see – you get a free trial period. If you don’t like it after 100 days, then you get your money refunded. 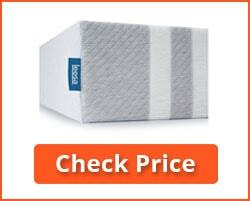 The Leesa Mattress gets 86% 4-5 star reviews and just 9 of 1-2 stars. Many people like it in spite of our comments below. Very little information regarding hardness and no ILD rating available on the company’s website. The memory foam layer is very thin, and it seems doubtful if this middle layer offers the full memory experience. It is included for its reviews, but is not near the top because of the sparse information and low memory layer situated below a 2” latex-like foam. Top layer: 1” cool foam. 2nd layer: 2″ memory foam with Green Tea, Charcoal and Natural Castor Oil. 3rd Layer: 3” pressure release foam to protect pressure points. 4th layer: 6” high density foam for durability and stability. Gets 86% reviews of 4-5 stars and 9% 1-2 stars. Many negative reviews related to a lack of edge support and wear, loss of memory function and general loss of integrity over a short timescale. This could be due to the low 2” thickness of the memory layer. Editor’s Note: Negative contents regarding life are worrying, particularly in view of the thin 2” memory foam layer. Just like the vast majority of mattress vendor, no numerical figures are given to density or deflection – it simply described as medium. General Notes: These ratings are based on 10 of the best consumer mattresses available. We have not included orthopedic mattresses or those manufactured at high prices by medical companies. It’s a pity that more manufacturers do not quote the Indentation Load Deflection (ILD) which is a more important measurement of how people sink into the mattress than the foam density. 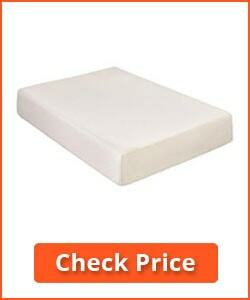 This is an important property for a mattress, memory foam in particular. As explained in the Buyer’s Guide below, ILD is a measure of the weight needed to indent 50 square inches of a 4-inch layer of foam by one inch (25%). It is a more relevant measurement than just the density of the foam. A soft foam might take just 8 lb ILD while a hard foam can take up to 20 lb (ILD=20). A memory foam mattress is designed to help you sleep well. The therapeutic benefits of having a good night’s sleep are often very underestimated. Even those who appreciate the value of sleeping well tend not to change their sleeping habits or simply pay lip service to it at most. When buying a new bed, most people pay more attention to the bed design than to the mattress – they tend just to take the mattress that comes with the bed. However, the mattress is significantly more important than bed design when it comes to sleeping well. A memory foam mattress can make a fantastic difference to the quality of your sleep, and can be used on just about any design or size of bed. The mattresses we have chosen are available in a number of different sizes, and you can choose your required size at checkout. Most people spend around one-third of their lives sleeping. It makes sense to get the most comfortable mattress you can. The mattress is far more important than the structure designed to hold it – the former provides comfort while the latter provides only the looks. Be honest – how many people visit your bedroom? How important is the design of your bed compared to its comfort? Memory foam mattresses were originally developed by NASA, the American space agency. They were designed to minimize the discomfort and even pain experienced by astronauts when seated for extended periods under high gravitational forces, or G-forces. It was found that high-density visco-elastic foams used body heat to mould around the astronaut’s body. The result was a reduction in pressure points and greater unimpeded circulation of blood. By applying this science to mattresses, it is possible to create a base that refreshes and relaxes you from the very first time you use it. This is just one of the many benefits that space exploration has brought to ordinary people. Memory foam mattresses are available right now for anybody who wants a space age sleeping experience. They enable you to avoid sleep deprivation that can leave you tired, irritable and lacking concentration. In fact, a lack of good sleep can lead to depression and other health issues. Not everything connected to even the best rated memory foam mattress is positive. There are some negatives, one of the most important being that they should not be used for babies or very young children. They can find it difficult to change sleeping position, and can be smothered by a build-up of carbon dioxide in the depressions. Most people can move about when sleeping, but babies might find it difficult once the mattress has conformed to their shape. This is not an issue with older toddlers or adults. Some comment on their safety with regard to chemical content. Rest assured that, if any mattress did not conform to national toxicity standards, it would not be permitted to be sold. 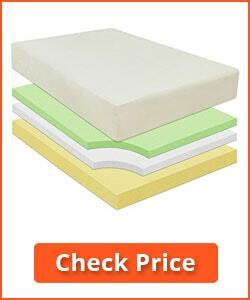 The memory foam mattresses we recommend on this site meet the required standards. All mattresses sold in the USA must have flame-proofing that meets federal safety laws. So don’t worry about mattress safety in that respect. Many mattresses emit a chemical or ‘paint’ smell when first opened. Generally, this smell will dissipate soon after use. It may take a few days, a week or slightly longer, but it should disappear. This is particularly so if an ‘organic layer’ is used, such as foam made using bamboo or tea tree. Small Children: We do not recommend that you use memory foam mattresses for small children and babies. Manufacturers caution about leaving babies and small children unattended on memory foam mattresses, as they may find it difficult to turn over, and may suffocate. There are fears that tots may find it difficult to roll over and that they may suffocate as a result. The mattress indentation can trap carbon dioxide resulting in infant sudden death syndrome (ISDS). Good question: how do memory foam mattresses work? How is the foam different to normal foam mattresses – many of which are far from comfortable? When you are asleep, and your body is still for a while, the foam conforms to your contour. It ‘memorizes’ your body shape and provides pressure points such as your hips with maximum support and comfort. However, unlike ordinary foam, such as the foam in a kitchen or bath sponge, memory foam is ‘viscoelastic’. It is temperature sensitive – the longer you lie on it, and the more body heat it absorbs, the more it moulds to your body contours – mainly to your bone structure at the hips and shoulders. This means that your body is properly supported and your spine does not deform as it does with ordinary foam or spring mattresses. The foam deforms and stretches slowly, and when you move it releases the absorbed energy slowly and deforms again to your new shape. Once memory foam mattresses have been stretched to your shape, they will gradually need lower forces to regain that shape next time. 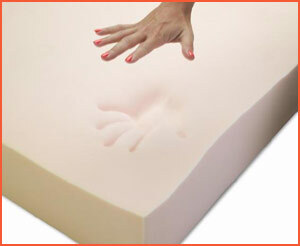 Arthritis sufferers report less pain and discomfort when using a memory foam mattress. The foam is temperature sensitive, so it tends to sink more as your body temperature warms it up. Very quickly, it molds to your unique contours. If you sleep on your side, the foam sinks in much more at your shoulders and hips so—in theory—your entire body is always perfectly supported and your spine remains straight. Your weight is spread more evenly and the pressure is relieved on places like your shoulders and hips. That’s why many people find memory foam mattresses help to reduce the symptoms of problems such as back pain and arthritis. If you change position or turn over the mattress gradually molds to your new shape. In fact, viscoelastic foams stretch more over a period of time than if you applied a single sudden force. Also, it takes time for the mattress to regain its original shape. To sum up, a memory foam mattress slowly moulds to the shape of your body offering maximum support – there is no extra pressure applied to your hips, shoulders or other prominent areas of your body. When you move when sleeping, the shape takes time to change, but meantime moulds to your new sleeping contour. This results in well-supported sleep and less pain. They are also manufactured with added anti-microbial agents so are healthier to use than regular mattresses. It is important not to go just by ILD or density but to take both into consideration. Density and thickness are generally more important than firmness. A good supportive memory foam mattress should use visco foam of 3 – 6 pounds density (Medium –High) and an ILD (firmness) of up to 13-15. The memory foam layer should be 3 – 5 inches thick and be sensitive to body temperature. Note that few manufacturers state the ILD of their foams, so we have not included that in the Table. It is important to get the combination of thickness, density and firmness correct. A memory foam mattress with ILD of 9 would be medium soft, irrespective of how dense or thick the mattress was. In the same way, an ILD 15 mattress would not work with a 3-pound (low density) memory foam – the mattress might be firm, but it would not support your body weight the same way a 5 lb (medium density) mattress would. You need a good combination of ILD and density: up to 13-15 ILD and 3-5 lb density. You could go slightly higher with density but not much lower. An ILD of 9+ on a high-density foam would suffice most people, though large, heavier people may require an ILD of 13-15. If you prefer a firmer mattress, then a higher density foam will provide a firmer surface than a lower density foam with the same ILD. A 4.5-pound density memory foam offers a good balance between hard and soft. You can go down to 3 lb for a softer bed and up to 5 or even 6 lb for a firmer bed – both would work with a 9-14 ILD memory foam. Many believe that the lower the density, then the less the overall ‘memory’ life of the mattress. Thus, a 5 lb mattress may last up to 10 years more than a 3 lb mattress. Keep in mind that the whole mattress thickness will not be memory foam. The base will be a normal polyurethane foam, the function of which is to distribute the mattress evenly over the frame of the bed. Onto that will be the body heat-sensitive memory foam layer, which should be at least 3-4 inches thick (7.5 – 10 cm). The PU acts as a support foam, while the memory foam provides the cushioning – the ‘comfort’ layer. Some have other layers to permit air movement and cooling – memory foams tend to heat up during the night. In general, if you purchase a mattress 12 inches thick (the thickness of our reviews), then the memory foam should ideally be at least a third of that: 4”. A 2-inch layer of memory foam would be too thin to operate correctly for any length of time. A 12“ mattress will often come with 3” memory foam or less – they may work as they should for a while, but will also lose the ‘memory’ properties quicker than a 3.5” or 4” plus memory layer would. 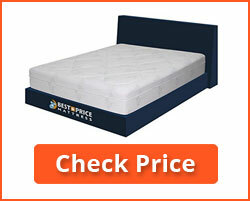 One issue you may find with any mattress is that heavier people need a firmer mattress. This is just as true with the best memory foam mattress as it is with any other type. If two people are of disparate sizes and weights, then one may find the mattress ideal, while the other may find it too soft or too hard. Memory foam mattresses tend to conform to each partner if they stay on their own side of the bed. However, sometimes there is a compromise to make on hardness – just as with a spring or regular foam mattress. Some people add a topper pad of memory foam to their existing mattress. You can do this if you don’t want the cost if a totally new mattress. If you go this way, then make sure it is thick enough to give the benefits of memory foam with your mattress. If your current mattress is on the soft side, then you may need a 4-inch topper pad although some find a 3-inch (7.5 cm) pad does the job. 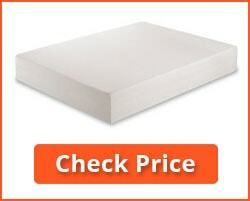 Topper pads may not be as effective as mattresses designed specifically for memory foam, but they certainly cost less. There are several published reasons why a memory foam bed is healthy. To begin with, your body temperature can determine how well you sleep. As your body temperature increases, a memory foam bed will soften, allowing you a more comfortable sleep. However, there are a few things to consider before you buy one of these mattresses. The depth of the mattress and the percentage of memory foam layer are very important. That is due to the way such memory foam mattresses work. The foam ‘memorizes’ the shape of your body when sleeping, and contours itself to provide you with maximum comfort, especially with respect to the placement of your hips and the other larger and more prominent bones that can cause discomfort. Reduction in pressure sores: A NASA STI (Scientific and Technical Information) bulletin reported several health benefits of what it referred to as Tempur foam. For example, it found that when a hospital patient has had to lie immobile on a firm regular mattress, a lack of sufficient blood flow leads to pressure sores developing – and in some cases even gangrene. These incidences decreased significantly when the mattress was changed to a memory foam mattress. A reduction of pain in fibromyalgia was another. Memory foam mattresses have some perceived issues. Among these are the initial chemical odor that quickly disappears, and also the heating factor. Some people do not like the heating that memory foam can lead to. Developments have led to gel foam, to dissipate this heat, and organic mattress layers that absorb the initial odors emitted by new mattresses of this type. Here are some comments on these. Bamboo fiber and charcoal mattresses absorb odors and keep your mattress smelling fresh. You may find a separate thin bamboo charcoal layer in your mattress for this reason. Another option is tea tree, or green tea. This absorbs odors and helps to keep your mattress smelling fresh. Whether such organic additives continue to work their magic after the initial odors associated with new memory mattresses have been dissipated is debatable. However many people like them so we have included them in our list or top products. We have included gel foam mattresses in our list. Gel foam is a normal viscoelastic foam containing large numbers of gel beads. One potential issue with traditional memory foam mattresses is that they tend to trap heat. Because of this, they can take a long time to reform as your body changes position. Your bed can also feel warm – sometimes too warm for people lying in the same position all the time. Positives: Gel foam does not trap heat in this way, so changes shape with your sleeping position more rapidly. This is their main benefit – heat is dissipated at a faster rate. Not only does the mattress feel cooler, but you can change position regularly without disturbing your sleeping partner. Negatives: The gel can eventually heat up during the night if two people are sharing the mattress. Initially, the gel will release volatile organic compounds (VOCs) that emit an odor, although this dies down after several days. Traditional memory foam mattresses are the same. Like any other item of furniture, there are things to look for when buying a memory foam mattress. The first is the density of the foam. If the foam is too light then it will not properly support your body. Lower density foams allow you to sink into your mattress more, while higher density foams offer more support. Densities are expressed in pounds in the USA and kilograms most other countries. Some mattresses are described as being simply Low, Medium or High density. The firmness of a memory foam mattress is expressed in either ILD (indentation load deflection) or density. IDL is tested by measuring the pressure needed to indent 50 square inches of a 4-inch layer of foam by one inch. The higher the figure, the harder the foam. Check the depth of the memory foam layer. Ideally, this should be 3” – 4” You might get away with 2”, but thinner layers tend not to be as comfortable as the thicker memory layers and you can lose the ‘isolation’ effect where your movement does not affect your partner. With much over 4” you can tend to get ‘stuck’ in the foam, and find it more difficult to change position. If they are not stated, then ask the supplier for details of density of the mattress in pounds and its ILD. An ILD of 9-11 is OK if you have a higher density mattress of 4-5 lb. Many people prefer the softer feel of 3 – 4 lb mattresses over higher densities. Gel foams tend to remain cooler than standard memory foams, though still eventually reach body temperature. They also regain shape faster than traditional memory foams. However, they can be less durable with a shorter life. Plant-based mattresses are more durable, tend to be cooler and regain their shape the quickest. Multi-layer mattresses can combine the above benefits. In general, the memory foam should comprise the top layer, though one mattress reviewed has a thin top cooling layer. Some such mattresses offer a relatively thin memory layer of 2 – 2.5 inches which offers a reduced ‘memory’ effect. 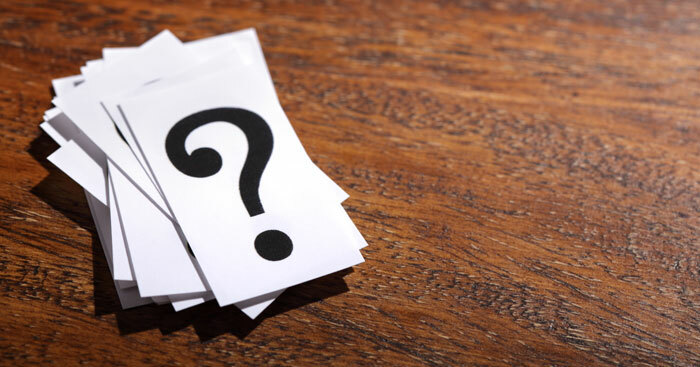 Here are some questions we have been asked about memory foam mattresses. 1. How thick should a memory foam mattress be? Memory foam mattresses should be thicker and denser than a regular spring mattress. The normal range is around 8- 14 inches and over, and we have reviewed the 12-inch versions where available. What is more important is the thickness of the memory foam layer – this should be at least 2.5 – 3 inches in the best memory foam mattress. The more memory foam the more support the mattress will provide. 2. I have a bad back. Can I use a memory foam mattress? Yes – memory foam shapes to the contours of your body providing support to all areas of your body in contact with it. It is suitable for people suffering conditions such as arthritis, lumbago, fibromyalgia and a range of sport-related injuries. 3. Why does memory foam make me feel warmer in bed? There are two main reasons for this. The first is that, because it conforms to your body contours, more of your body is in contact with the mattress, so there is less air flow around it. Also, memory foam is heat-sensitive. It absorbs your body heat to allow it to soften and fold round you for a more comfortable sleep. 4. Can I still use my electric blanket? You can if you wish. There are no technical or safety reasons why not. However, keep in mind that a memory foam mattress will soften with heat and retain it, so you could feel extra warm is using an electric blanket. You will also likely sink more into it, so for comfort reasons alone it may be better not to use and electric blanket. Try it without first, and use it only if necessary – at a low setting if available. – and never when you are sleeping. Use it only to take the chill off the bed, and switch it off before you go to bed. 5. Do I have to turn my memory foam mattress? You have no need to flip your memory foam mattress – it is designed to be used only one side up, not flipped like you would do with a spring mattress. You can turn it 180 degrees, that is switch head to toe. In fact, you can do this monthly for six months and then every three months to make sure your memory foam mattress wears evenly. This can increase the life of your mattress. 6. Can I use my new memory foam mattress on my existing bed base? It depends on the bed base. Generally, your memory foam mattress can be used on your bed base although it will work best on a completely flat platform base. You can use it on a sprung base so long as the springs are not too soft, and also on a wooden slat base if the slats are no more than 3 inches apart. 2 inches would be better. 7. What about dust mites? Your memory foam mattress should have a solid core. Dust mites prefer an open structured mattress, such as a spring mattress. If you keep your mattress clean and give it a regular sweep over, then it will breed far fewer dust mites than a regular spring or foam mattress. Check out our article “Can Dust Mites Live in Memory Foam Mattresses and Pillows?” for more details. Choosing a memory foam mattress is not easy. The top rated memory foam mattress might not suit you, unless it has a choice of density and compressibility (ILD). Heavier people will require a harder memory bed than a lighter person. There is no one-for-all mattress when it comes to memory foam. However, you will find it easier to make your choice by reading the user guide above. If you have read it once then read it again and fully understand what you are looking for. Only then are you likely to make the best choice, particularly if there are two of you using the same mattress on the same bed. If you tend to get too warm in bed, then a mattress that compresses less will suit you better than a softer one that compresses more. A soft memory foam mattress will heat up more as you sink into it – and these mattresses hold their heat. Great for winter months or cold climates, but you might otherwise prefer to purchase one with a heat-dissipating memory gel foam layer or some form of air flow foam beneath the memory foam. This can sometimes reduce then life of the mattress, but it can feel more comfortable assuming the memory layer is at least 3” thick. Some people who find the memory foam not sufficient for their needs overcome this issue by laying a memory foam topper pad on top. Amazingly, best price mattresses also have the best price too! I shall reread your wonderful descriptions of all foam beds until I get what I need. Thank you.